Once, there were two brothers who worked together as a team. They took care of their flock, played together, and often dust-bathed in the same hole. One brother was the leader and the other brother was okay with being number two……and then one day, everything changed. It’s a sick feeling when you go out to the chicken pasture and realize that no one is there…..that feeling of apprehension merely heralded in the roller coaster of emotions and events that would soon take over our entire weekend and continue throughout the coming weeks. As I searched for my flock, I found my boys covered in blood and could only imagine that my worst chicken fears had come true….that we had an intruder. I quickly discovered there was no intruder…..just that the days of calm brotherhood were over. 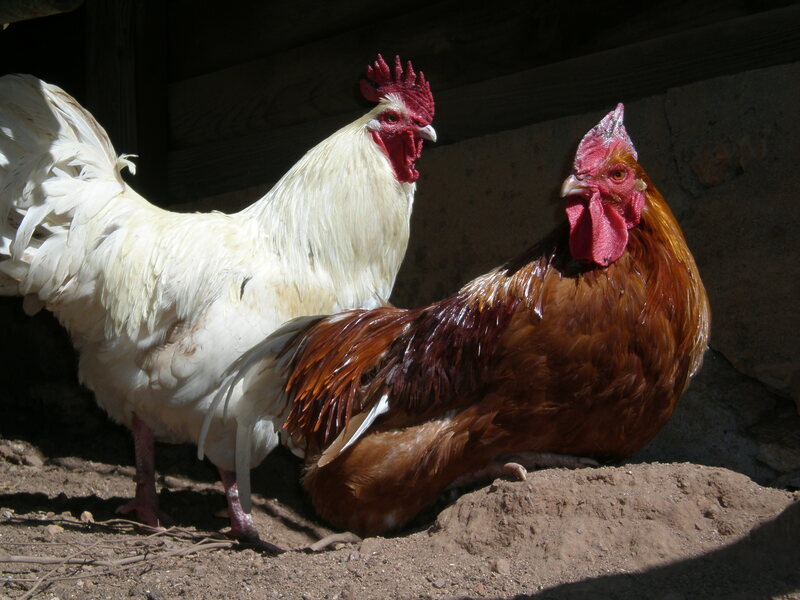 Mini, a Golden Comet, had been head rooster since the brooder box days, and Andy, our enormous, gentle, White Langshan had always just accepted “roo number two” abuse with easygoing grace…..never rocking the boat. Well, that Friday the boat capsized, and I found myself out in the middle of a wet pasture, in my pajamas, standing between two fighting, mad roosters. There were few options available to me. Take one boy out and call it done, accepting the fact that he could never go back…..and how could I choose between my boys? My other option was to let them fight it out in hopes that they could come to some sort of rarely heard of rooster peace. For better or worse, I made my choice. I moved back and stood next to the pasture fence with the hens, who had been hiding in a spare barn stall, scared of their own protectors. Watching roosters fight, no holds barred, is one of the most distressing and painful things I’ve ever seen…..and maybe this was worse because these were MY birds. Though we had trimmed their spurs just two nights previously, it didn’t make much of a difference since the boys were prone to biting rather than spurring. Once the dust settled, it was obvious we had a New World Order in chicken land. The excitement that usually comes with spring had quickly vanished, and the stress of the coming weeks seemed likely to overcome us all….human and chicken alike. Such beautiful boys! I find myself anxious to hear what has become of them. We had to get rid of 2 of our boys just this morning. We still have 2 more–hope they don’t end up where your boys have. I know the feeling. My little yellow was covered in blood a couple of weeks ago. I gave him and a couple of hens to my broother. A man Iworked had recently given me two more hens. My big rooster jumped me this weekend. Thanks KerryJuicy! We’ve been in the process of overhauling some things here on the farm – we’ll be updating again soon. Thanks for checking in!